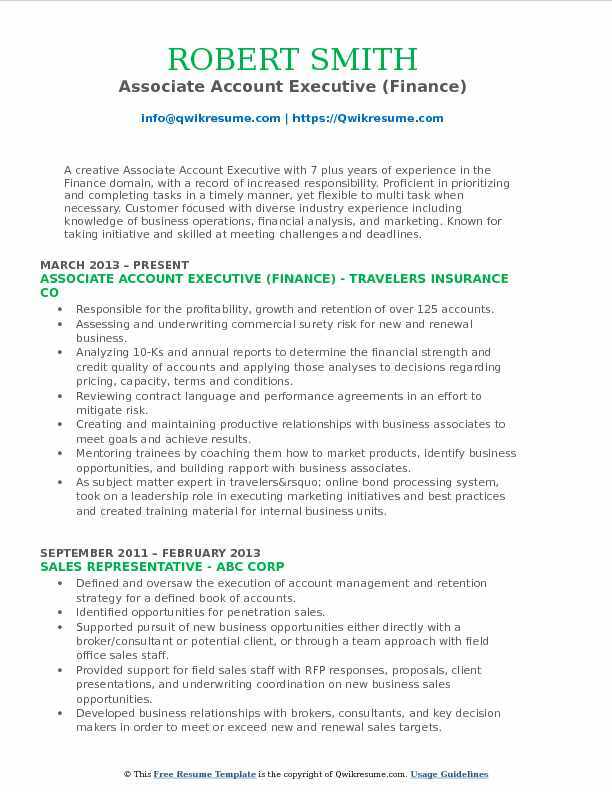 Associate Account Executive of a business is the backbone of maintaining a professional-client relationship. There are diverse tasks to be discharged by an associate account executive like managing business expenditure, ensuring smooth workflow, reporting clients accounting file details to the account Manager and providing appropriate feedbacks or updates to multiple customers on time. 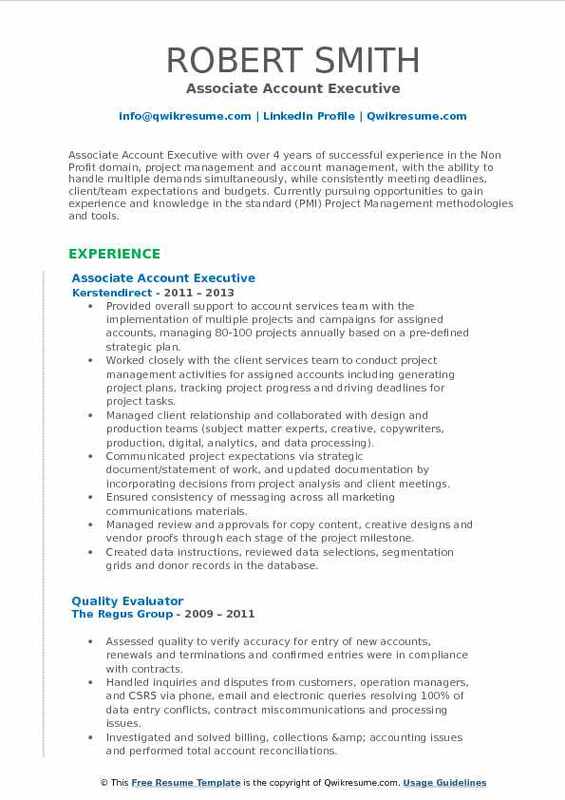 An Associate Account Executive should also manage the company accounts and see to it that it is maintained accurately. 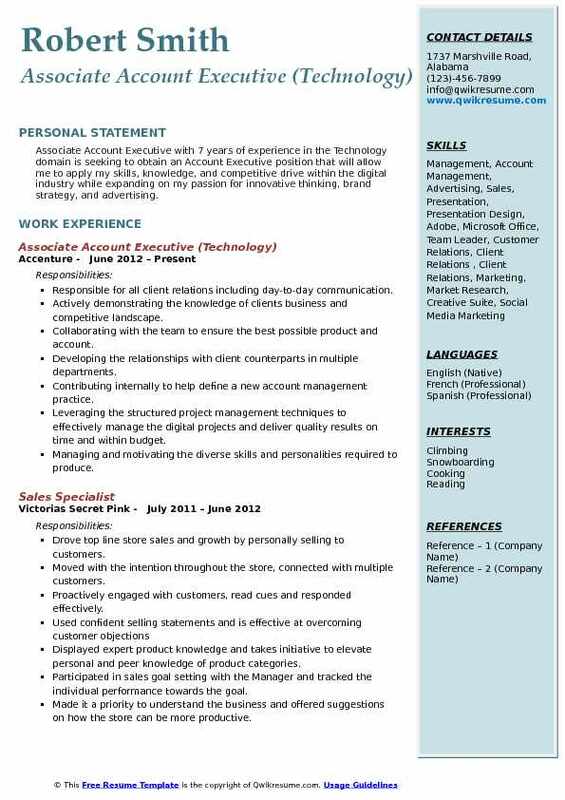 An Associate Account Executive Resume sample that portrays excellent communicative skills, proficiency in computers, time management capability, and organizational skills with the willpower to work under any pressure gets shortlisted at interviews. A Bachelor’s Degree in Accounting, Finance or Business Administration is sufficient to gain entry as an Associate Account Executive. However Additional certification in the related field will prove to be beneficial for seeking this job post. 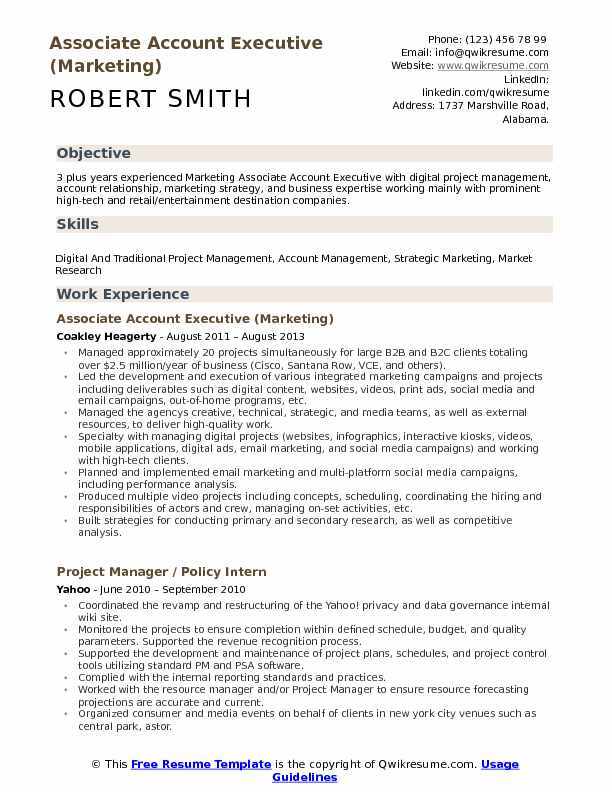 Objective : 3 plus years experienced Marketing Associate Account Executive with digital project management, account relationship, marketing strategy, and business expertise working mainly with prominent high-tech and retail/entertainment destination companies. Managed approximately 20 projects simultaneously for large B2B and B2C clients totaling over $2.5 million/year of business (Cisco, Santana Row, VCE, and others). Led the development and execution of various integrated marketing campaigns and projects including deliverables such as digital content, websites, videos, print ads, social media and email campaigns, out-of-home programs, etc. Managed the agency's creative, technical, strategic, and media teams, as well as external resources, to deliver high-quality work. Specialty with managing digital projects (websites, infographics, interactive kiosks, videos, mobile applications, digital ads, email marketing, and social media campaigns) and working with high-tech clients. Planned and implemented email marketing and multi-platform social media campaigns, including performance analysis. Produced multiple video projects including concepts, scheduling, coordinating the hiring and responsibilities of actors and crew, managing on-set activities, etc. Built strategies for conducting primary and secondary research, as well as competitive analysis. Drove brainstorming sessions to generate exciting concepts that solved tough challenges. Directly cultivated and strengthened effective agency-client relationships with new and existing clients to build better project requirements and surpass stakeholder expectations. Headline : Creative, organized, problem-solving Senior Associate Account Executive with 6 years of boutique agency experience in the travel & hospitality industry. Enthusiastic, self starter with an unyielding dedication for unleashing my creativity through all forms of communication - visually, verbally and in writing. Interested in a position with a hospitality or lifestyle brand that is open to targeted, unconventional methods for reaching their target audiences. Managing the day-to-day media relations + communications efforts for internationally recognized boutique hotels & resorts. Creating, pitching and placing news features and trend stories in U.S. & Canadian regional, national, and niche media outlets across all mediums (broadcast, print and online). Developing and maintaining the professional relationships with journalists, bloggers, editors and influencers across various industries. Sourcing, securing and executing the strategic media and wide-reaching brand partnerships. Overseeing and implementing the curated, interactive media events and press trips, including the creation of tailored itineraries, partnering with relevant vendors & destination tourism boards, and securing hand-picked media to deliver desired coverage. Developing annual, strategic PR plans with the goals of increasing brand awareness, generating media exposure and driving business. Conceptualizing, designing and creating content for client collateral (press kits, press releases, newsletters, media materials, social visuals). Managing all aspects of client social media across multiple channels, including promotions, influencer campaigns and giveaways. Coordinating with advertising, digital marketing and corporate communications teams to align strategies and develop brand voice. Assessing the clients quarterly sales to help determine next steps for driving business, increasing adr and maximizing ROI through targeted PR efforts. Acting as a brand spokesperson for agency and clients for media opportunities. Pitching and coordinating the media reviews and interviews for the individual clients. 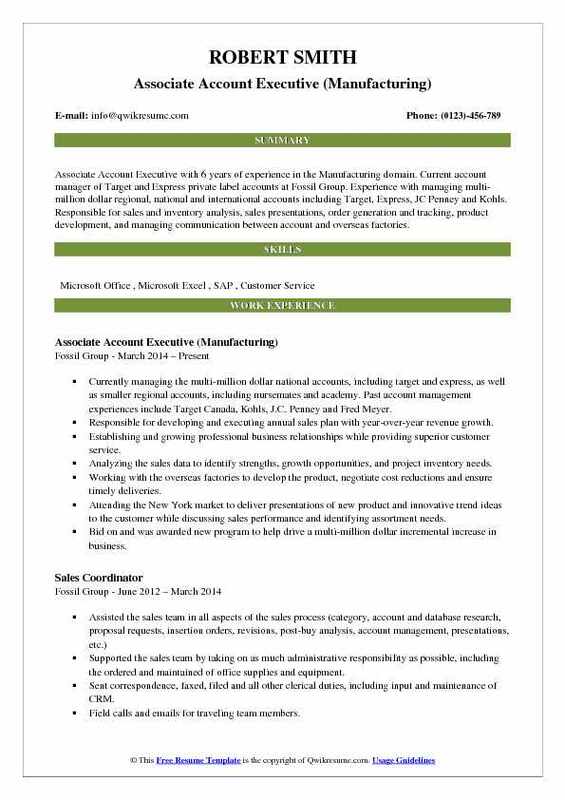 Headline : Associate Account Executive with 6 years of experience in the Manufacturing domain. 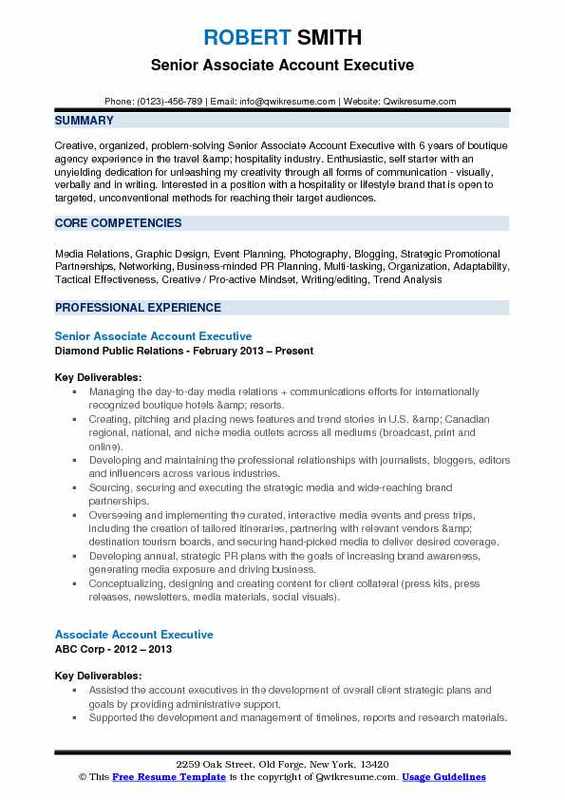 Current account manager of Target and Express private label accounts at Fossil Group. Experience with managing multi-million dollar regional, national and international accounts including Target, Express, JC Penney and Kohls. Responsible for sales and inventory analysis, sales presentations, order generation and tracking, product development, and managing communication between account and overseas factories. Currently managing the multi-million dollar national accounts, including target and express, as well as smaller regional accounts, including nursemates and academy. Past account management experiences include Target Canada, Kohls, J.C. Penney and Fred Meyer. Responsible for developing and executing annual sales plan with year-over-year revenue growth. Establishing and growing professional business relationships while providing superior customer service. Analyzing the sales data to identify strengths, growth opportunities, and project inventory needs. Working with the overseas factories to develop the product, negotiate cost reductions and ensure timely deliveries. Attending the New York market to deliver presentations of new product and innovative trend ideas to the customer while discussing sales performance and identifying assortment needs. Bid on and was awarded new program to help drive a multi-million dollar incremental increase in business. Building strong relationships with customers to make Fossil a valued strategic partner. Managing multiple aspects of the business including sales, product, planning and merchandising. 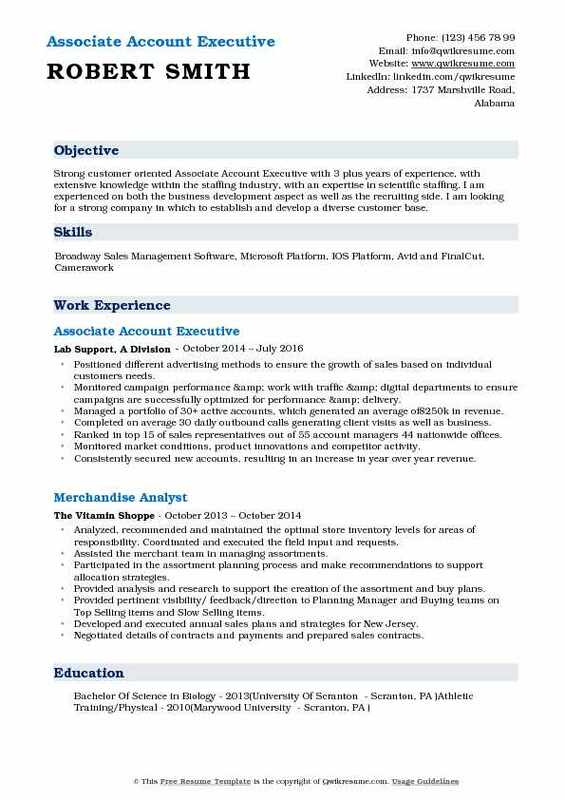 Experience with Microsoft office (with a strong emphasis in Excel), SAP, Vendor Retail Portals (i.e. Partners online, Grove site, Wercsmart, etc. ). Objective : Associate Account Executive with over 4 years of successful experience in the Non Profit domain, project management and account management, with the ability to handle multiple demands simultaneously, while consistently meeting deadlines, client/team expectations and budgets. Currently pursuing opportunities to gain experience and knowledge in the standard (PMI) Project Management methodologies and tools. Skills : Microsoft Office Programs (Microsoft Word, Microsoft Excel, PowerPoint) And Adobe Reader. Familiar With Various Database Software, Including Blackbaud CRM, PeopleSoft CRM And Webvantage. Provided overall support to account services team with the implementation of multiple projects and campaigns for assigned accounts, managing 80-100 projects annually based on a pre-defined strategic plan. Worked closely with the client services team to conduct project management activities for assigned accounts including generating project plans, tracking project progress and driving deadlines for project tasks. Managed client relationship and collaborated with design and production teams (subject matter experts, creative, copywriters, production, digital, analytics, and data processing). Communicated project expectations via strategic document/statement of work, and updated documentation by incorporating decisions from project analysis and client meetings. Ensured consistency of messaging across all marketing communications materials. Managed review and approvals for copy content, creative designs and vendor proofs through each stage of the project milestone. Created data instructions, reviewed data selections, segmentation grids and donor records in the database. Communicated project status, issues and risks, attended status meetings and participated/led client status calls. Gathered and entered project results and costs from direct mail data responses. Reviewed & approved estimates and invoices in comparison to budgets and projections. 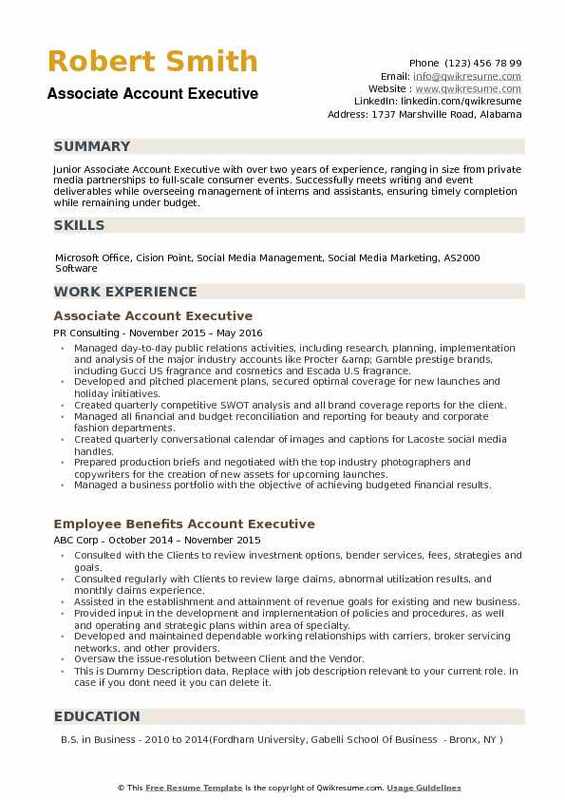 Headline : Associate Account Executive with 7 years of experience in the Technology domain is seeking to obtain an Account Executive position that will allow me to apply my skills, knowledge, and competitive drive within the digital industry while expanding on my passion for innovative thinking, brand strategy, and advertising. Responsible for all client relations including day-to-day communication. Actively demonstrating the knowledge of clients business and competitive landscape. Collaborating with the team to ensure the best possible product and account. Developing the relationships with client counterparts in multiple departments. Contributing internally to help define a new account management practice. Leveraging the structured project management techniques to effectively manage the digital projects and deliver quality results on time and within budget. Managing and motivating the diverse skills and personalities required to produce. Working collaboratively with internal marketing team to better Accenture's brand. Managing the teams through all multiple disciplines: define, creative design, and front-end. Maintaining a high client return rate for new projects with a quick turnaround between each project. Successfully turning around unprofitable or inefficient accounts and projects. Objective : Strong customer oriented Associate Account Executive with 3 plus years of experience, with extensive knowledge within the staffing industry, with an expertise in scientific staffing. I am experienced on both the business development aspect as well as the recruiting side. I am looking for a strong company in which to establish and develop a diverse customer base. Positioned different advertising methods to ensure the growth of sales based on individual customers needs. Monitored campaign performance & work with traffic & digital departments to ensure campaigns are successfully optimized for performance & delivery. Managed a portfolio of 30+ active accounts, which generated an average of$250k in revenue. Completed on average 30 daily outbound calls generating client visits as well as business. Ranked in top 15 of sales representatives out of 55 account managers 44 nationwide offices. Monitored market conditions, product innovations and competitor activity. Researched and secured 2 new accounts monthly in New Jersey territory. Planned, created and delivered sales presentations at Trade Shows, Client Meetings. Summary : A creative Associate Account Executive with 7 plus years of experience in the Finance domain, with a record of increased responsibility. Proficient in prioritizing and completing tasks in a timely manner, yet flexible to multi task when necessary. Customer focused with diverse industry experience including knowledge of business operations, financial analysis, and marketing. Known for taking initiative and skilled at meeting challenges and deadlines. Responsible for the profitability, growth and retention of over 125 accounts. Assessing and underwriting commercial surety risk for new and renewal business. Analyzing 10-K's and annual reports to determine the financial strength and credit quality of accounts and applying those analyses to decisions regarding pricing, capacity, terms and conditions. Reviewing contract language and performance agreements in an effort to mitigate risk. Creating and maintaining productive relationships with business associates to meet goals and achieve results. Mentoring trainees by coaching them how to market products, identify business opportunities, and building rapport with business associates. As subject matter expert in travelers’ online bond processing system, took on a leadership role in executing marketing initiatives and best practices and created training material for internal business units. Assisting the account executives with creative idea generation, gaining approvals internally and from clients, timely promotional submissions, execution of thorough & timely campaign recaps within one week of program completion. Utilizing the experience in multi-media to manage sales opportunities and monitoring the accounts. 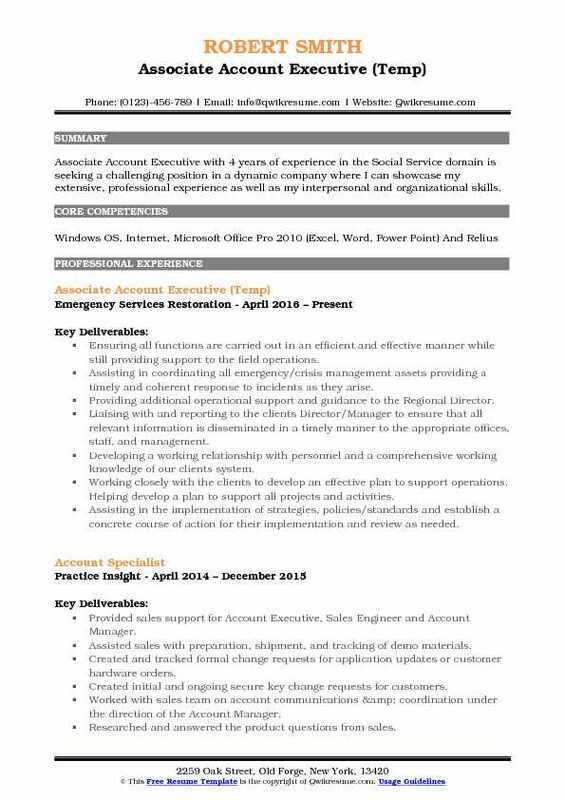 Objective : Associate Account Executive with 4 years of experience in the Social Service domain is seeking a challenging position in a dynamic company where I can showcase my extensive, professional experience as well as my interpersonal and organizational skills. Ensuring all functions are carried out in an efficient and effective manner while still providing support to the field operations. Assisting in coordinating all emergency/crisis management assets providing a timely and coherent response to incidents as they arise. Providing additional operational support and guidance to the Regional Director. Liaising with and reporting to the client's Director/Manager to ensure that all relevant information is disseminated in a timely manner to the appropriate offices, staff, and management. Developing a working relationship with personnel and a comprehensive working knowledge of our clients system. Working closely with the clients to develop an effective plan to support operations. Helping develop a plan to support all projects and activities. Assisting in the implementation of strategies, policies/standards and establish a concrete course of action for their implementation and review as needed. Liaising with the branchs to ensure that training procedures and policies are implemented within standards. Offering leadership, management and tactical guidance to the branch managers and operations managers assigned to handle the client sites as needed. 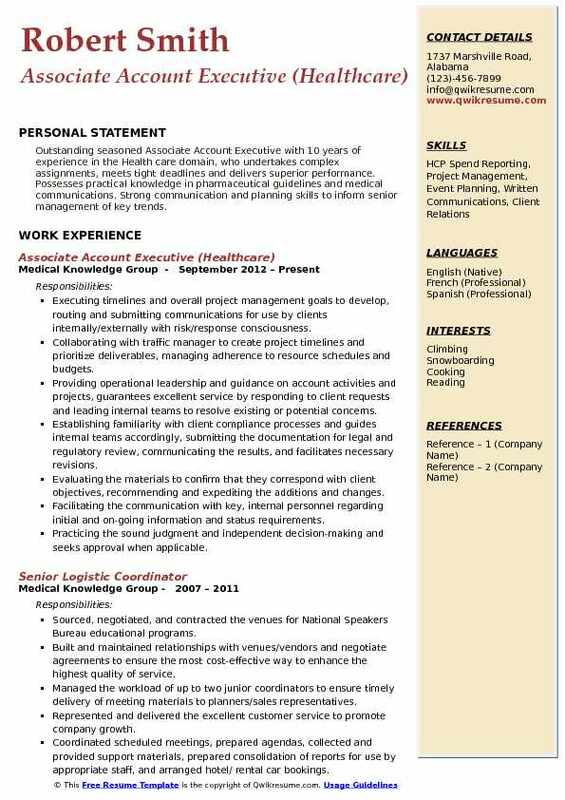 Summary : Outstanding seasoned Associate Account Executive with 10 years of experience in the Health care domain, who undertakes complex assignments, meets tight deadlines and delivers superior performance. Possesses practical knowledge in pharmaceutical guidelines and medical communications. Strong communication and planning skills to inform senior management of key trends. Executing timelines and overall project management goals to develop, routing and submitting communications for use by clients internally/externally with risk/response consciousness. Collaborating with traffic manager to create project timelines and prioritize deliverables, managing adherence to resource schedules and budgets. Providing operational leadership and guidance on account activities and projects, guarantees excellent service by responding to client requests and leading internal teams to resolve existing or potential concerns. Establishing familiarity with client compliance processes and guides internal teams accordingly, submitting the documentation for legal and regulatory review, communicating the results, and facilitates necessary revisions. Evaluating the materials to confirm that they correspond with client objectives, recommending and expediting the additions and changes. Facilitating the communication with key, internal personnel regarding initial and on-going information and status requirements. Practicing the sound judgment and independent decision-making and seeks approval when applicable. Managing the work load of up to two junior coordinators to ensure timely execution of deliverables. Objective : Junior Associate Account Executive with over two years of experience, ranging in size from private media partnerships to full-scale consumer events. Successfully meets writing and event deliverables while overseeing management of interns and assistants, ensuring timely completion while remaining under budget. Managed day-to-day public relations activities, including research, planning, implementation and analysis of the major industry accounts like Procter & Gamble prestige brands, including Gucci US fragrance and cosmetics and Escada U.S fragrance. Developed and pitched placement plans, secured optimal coverage for new launches and holiday initiatives. Created quarterly competitive SWOT analysis and all brand coverage reports for the client. Managed all financial and budget reconciliation and reporting for beauty and corporate fashion departments. Created quarterly conversational calendar of images and captions for Lacoste social media handles. Prepared production briefs and negotiated with the top industry photographers and copywriters for the creation of new assets for upcoming launches. Managed a business portfolio with the objective of achieving budgeted financial results. Demonstrated an ability to manage multiple projects and deadlines simultaneously.